I want to begin by explaining why I chose this title. First, we go back all the way to Lewis’ childhood. From a very early age Lewis had loved fairy stories, legends and myths. He delighted particularly in the myths of the Norsemen – the sagas of Norway and Iceland. These stories gave him a sense of deep joy and longing for things strange and remote. Later as a teenager and then a young man he began to experience some of this same sense of longing and joy in the works of two Christian writers: George Macdonald and G. K. Chesterton. At first he did not think that his interest was being aroused by their Christian convictions –rather by their power as storytellers and by the way his heart and imagination were deeply touched through their writings. He found the same thing with the poetry of George Herbert and John Donne. Much to his own surprise – and deep reluctance – Lewis began to move in his thinking: first to belief in some kind of universal power of goodness; then to a somewhat pantheistic acknowledgment of spirit; then to belief in a God who had made all things and who upholds the world. With all sorts of reservations and with strong hesitations Lewis began to think seriously about the Christian faith held by so many of his favorite writers. He gradually moved to a position where he believed in the God made known in the Bible as the creator of heaven and earth and as the judge of all people. He also came to believe that the gospels told accurate history. He had started attending church regularly – but he still was not yet a committed Christian, just an intellectual assent to Christian principles. His mind was in one place – but his will, his emotions and his imagination were still far away. On the evening of September 19, 1931, Lewis had a long discussion with one of his closest friends, J. R. R. Tolkien, and another friend, Hugo Dyson. Lewis said that he could not see what meaning Christ’s life, death and resurrection could possibly have for him living 1900 years after the events. Tolkien replied that the gospel works in the same way that myths work. Lewis had no problem in being moved by myths and legends – they gave him a sense of joy and touched a chord of longing in his heart. But, ‘they are lies breathed through silver’ Lewis replied. No, said Tolkien, they are not completely lies – rather, myths have elements of the truth within the distortions and unworthy outer husk they often wear. Myths, said Tolkien, are echoes or memories of the truth that God had originally made known to Adam and Eve, the ancestors of the whole human race. There are in myths, memories of the un-fallen world, memories of paradise when the world was not stained by human rebellion but was characterized only by goodness and joy in all of life; there is a sense of the shame and tragedy of the brokenness of our present life; and there are hints of the promise and hope of redemption, of the setting right of all things. The Gospel is the true myth, the great fairy story. In the Gospel of Christ all the elements of truth in the pagan myths find their fulfillment. This conversation (it went on till 3:00am) was a very significant turning point in Lewis’ conversion, for just a few days afterwards Lewis came to faith in Christ. Lewis never lost his interest in fairy stories and myths as vehicles of the truth. Though Lewis was not married until much later in his life, and never fathered children himself (he had two step-sons by his marriage with Joy Gresham), he was a man who loved children. Three important factors gave him reason to write stories for children. He had lifelong delight in children’s stories. He wanted to write stores for the children of his friends. Because of World War II Lewis had several children living in his home who were evacuated from London. These children, Lewis discovered, had not experienced the joy of stimulating their imagination with good stories. They were ignorant of myths and fairy tales, had not been read to by their parents and they read very little themselves. So Lewis felt challenged to write for such children himself. Lewis wanted to capture the imagination of children as his own imagination had been captured by myths and intentionally full of echoes of Eden (or echoes of the Christian Gospel). First, we find that there are Creation echoes – elements of the children’s adventures in Narnia that reveal the beauty of life as it once was before deceit, betrayal, rebellion, pride and every kind of evil entered the world. There is the loveliness of spring when Aslan comes and ‘shakes his mane’ – his description of the sudden coming of spring reminds us of the wonder and freshness of the original creation (which he captures so beautifully in The Magician’s Nephew). There is the peaceable nature of many of the creatures of Narnia (Mr. Tumnus is an example here) – and this recalls for us a happier and more innocent time. We find a celebration of the dignity and glory of ordinary persons – like Mr. Tumnus, the beavers and the giant Rumblebuffin – this is a dignity at which we can laugh without malice but with glad pleasure. There is the beauty of the snowy landscape, the frost and ice – even though this perpetual winter has been brought about by the wickedness of the witch – this beauty of perpetual winter still reveals the ‘dearest freshness deep down things’ (Hopkins), the reality that this world is made by a benevolent creator to flourish and to be enjoyed by its creatures. Above all there is great delight in the ordinary things of life – food and drink, dancing (the fawns, dryads and naiads), feasting (the Christmas party in the woods), marriage (the beavers), friendship, work well done, trust, loyalty and bravery. Second, we find many Echoes of the Fall – the tragedy of life as it now is. We see the reign of the White Witch, the instruments of her rule are deceit, power, fear, betrayal, cruelty, sorrow, destruction and death. In her kingdom it is always winter and never Christmas, for the witch hates happiness and ordinary joys; for her pleasant things are only a means to an end, and the end is always more power for her, less independence for others, less joy. Her fury at the Christmas feast in the woods is typical of real evil – this is the way Satan is: he hates the good gifts of God. She has no concern for anyone else – all creatures are objects to her, things to be used in her lust for power rather than persons to be respected. The account of Edmund being brought under her sway is masterful – this is indeed how evil works in our hearts and minds, appealing to our worst instincts, shrewdly summing up our character flaws and then exploiting them; she presents her treats as if they were generous gifts rather than instruments of deceit and control. The gifts of evil always have a cost – the Turkish delight and the hot drink – and do not satisfy, but rather enslave the one who receives them. Edmund begins to lie more and more and to deceive himself about the true nature of the witch, about himself and about everyone else. The impact on Edmund is to make him ever angrier with his brother and sisters, meaner, more spiteful, more self-centered – all evil is like this for it destroys our humanity, making us less than who we are. Notice too that his deceit and betrayal do not make him happy, but rather more and more miserable. This is the nature of evil: it always reaps a harvest of destruction in our own lives and the lives of others. Choosing evil is a curse with many points. Indulging in evil has the effect of alienating, or separating, him from others: his siblings, the beavers and other creatures; of alienating, or separating, him from himself; of making him very uncomfortable when Aslan is mentioned – just so evil alienates, or separates, us from God. Evil has the effect of alienating, or separating, him from nature and his proper place in this world, distorting his natural and right desire for dominion, for humans are made to rule in this world as God’s stewards. Edmund imagines himself as king of Narnia, indulging his every whim and keeping others, especially his elder brother, Peter, in lower positions than himself. Evil has the effect of undermining his enjoyment of the beauty of creation. Yet, Edmund is aware of what is happening to himself and he is not given up fully to evil – we see the struggle that takes place in him, the memories of goodness in his heart, and above all his pity for the creatures enjoying their Christmas party – the squirrels, foxes and satyrs whom the witch turns to stone – and this gives us a glimmer of hope for his deliverance and restoration, for pity is at the heart of redemption, which is where we now turn. Third, this story is full of Echoes of Redemption – the promise of what will be when Christ returns to establish his kingdom, destroy evil entirely and when peace, righteousness and joy will endure forever. We learn of the deep magic of the penalty of death for a traitor – inscribed as law by the Emperor over the sea. The witch knows this magic, but has no true appreciation of the importance of justice – for her it is her means of gaining some revenge, some fulfillment of her lust for power and death. At the very heart of the book we see the sacrifice of Aslan, offering himself as innocent in place of the one who is guilty – what Lewis calls “the even deeper magic from before the dawn of time.” In his self-sacrifice we see “justice and mercy kiss,” as Lewis writes about the death of Christ on the cross. We see not only Aslan’s death but also his resurrection from the state of death. We join the girls, Susan and Lucy, in their ‘disbelieving for joy’ as they are comforted by Aslan’s love and by the power of his indestructible life. We revel in his delight in encouraging the gifts and glory of others; of giving rewards, joy and greater responsibility to those who serve him. In the events that follow his return to life we see his healing breath giving life to the dead (the statues) and strength and courage to the weary. His defeat of the witch, the healings, the restorations to life and the coming of spring look forward to the final renewal of all things – the first-fruits of the ultimate consummation of Aslan’s kingdom, just as Christ’s defeat of the devil on the cross, his miracles of healing, his raising of the dead and his power over the created world point forward to his return and final victory over all the forces of evil and death. In all these ways, and many more, Lewis has filled this story with echoes of Eden. 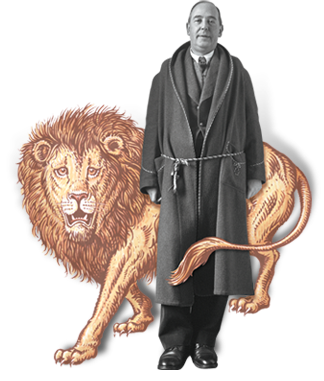 Lewis was asked once by someone: “Children growing up in Christian homes who are taught the Gospel by their parents will recognize Christ in these stories – but what about those children who do not know the story of Christ?” Lewis responded that he hoped and prayed that children who were ignorant of the Gospel of Christ would fall in love with Aslan and the echoes of Eden throughout the Narnia books, and that later on when they heard about Christ they would respond to Him as one whom they already knew and loved under the form of Aslan. I know people for whom this is true. It is my hope and prayer that the film will be faithful enough to Lewis’ story that God will use it in the same way to touch the hearts and kindle the imaginations of many, many more. This entry was posted in Jerram Barrs, Uncategorized and tagged Christmas, conversion, fantasy, G.K. Chesterton, George MacDonald, J.R.R. Tolkien, marriage, narnia.